You typically think of Google as the company that accesses your data without consent. However, Google's Project Vault is designed to help you keep your information from getting into the wrong hands. 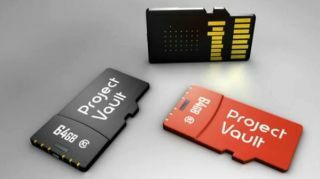 Google unveiled Vault, a microSD card that leverages enhanced encryption technology, during the company's Google I/O 2015 Day Two keynote. The basic premise of Vault is the ability to enable encrypted communications on a real-time custom operating system, or ARTOS, designed by Google. By inserting the card into your device, you essentially transport the encrypted operating system with you to better secure your photos, chats, emails and more. Think of a standard Intel or SanDisk microSD card, but one that runs on its own operating system, requires two-step authentication for accessing data and can be configured to encrypt using hashtags, signatures and passcodes, among other accessibility options. Vault is capable of storing 4GB of data, roughly 25% of a baseline iPhone. The chip is powered by an ARM processor, and it features NFC technology and an antenna. Interested parties can begin testing an enterprise-specific version of Vault today. Google says it is working on a consumer model, but did not provide an immediate release date. Vault works with all operating systems, including Android, Windows, OS X and Linux. What is the Best NAS in the US?